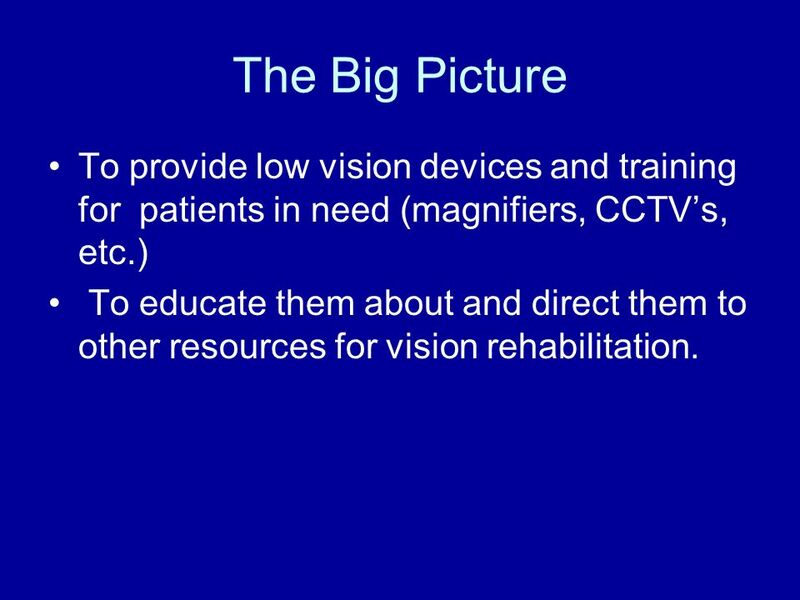 2 The Big Picture To provide low vision devices and training for patients in need (magnifiers, CCTV’s, etc.) To educate them about and direct them to other resources for vision rehabilitation. 3 Patient Flow Patient recommended by M.D. 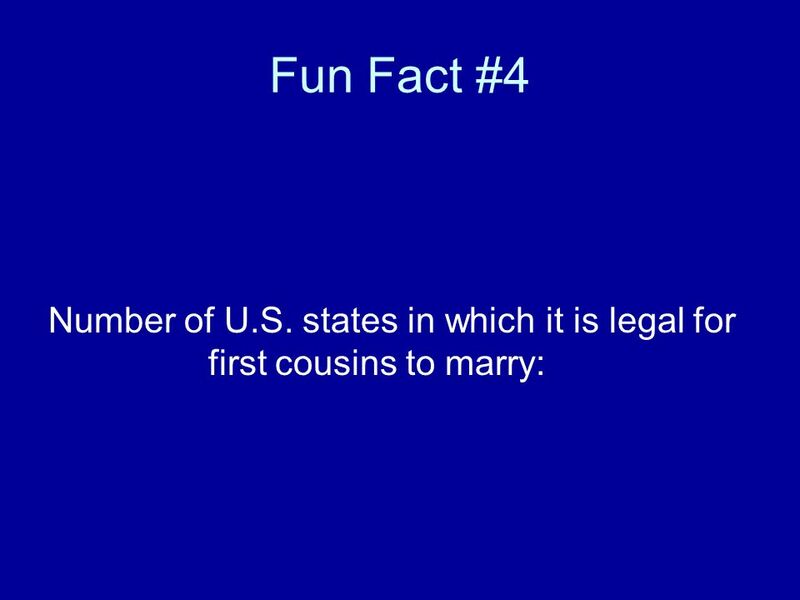 or O.D. 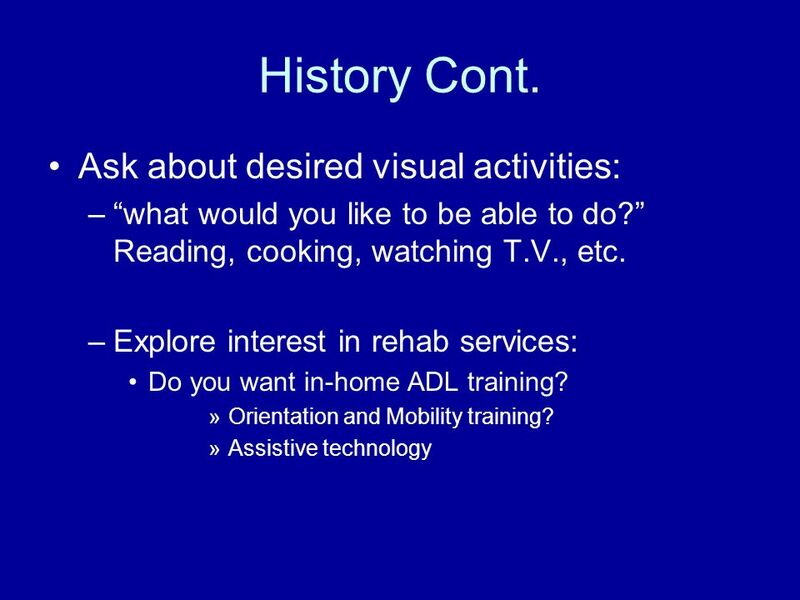 for vision rehab. (VR) because of reduced acuity, visual field loss or poor contrast sensitivity. Patient given info sheet by scribe or head tech that explains scheduling, fees, etc. Acuity 20/60 or better in better eye? Level 1 - regular schedule at GW or PF. Acuity 20/70 or worse in better eye or VF defect? Level 2 – Thurs. AM in GW. 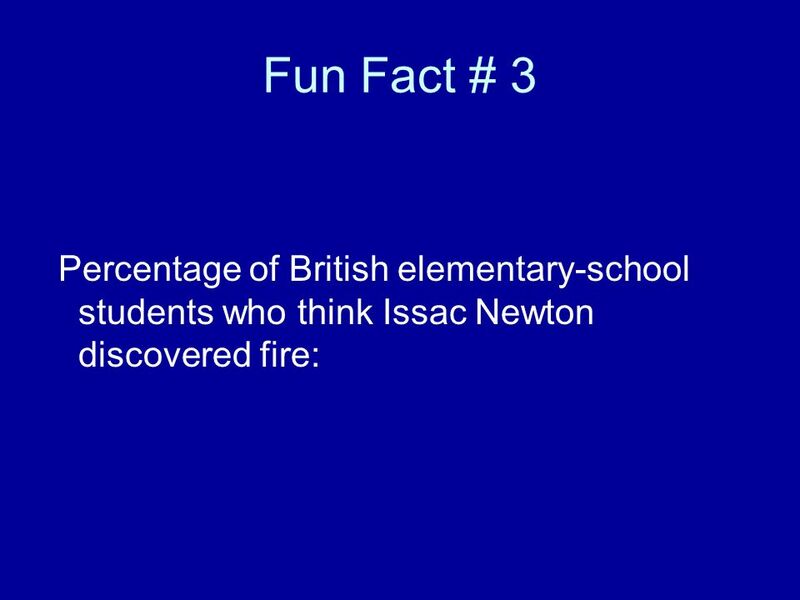 expands history, refracts, counsels, educates, makes material recommendations and may discuss other resources available. 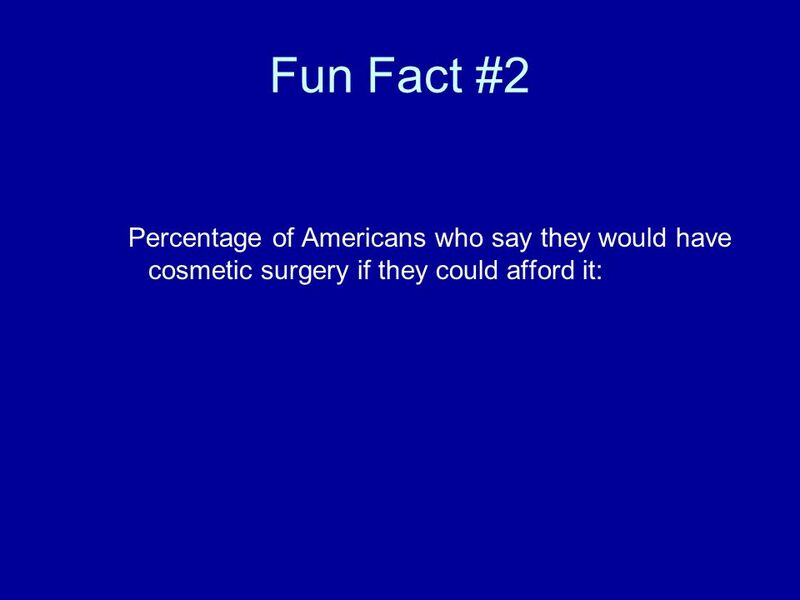 Optical: Demo/educate materials Patients purchase desired items. 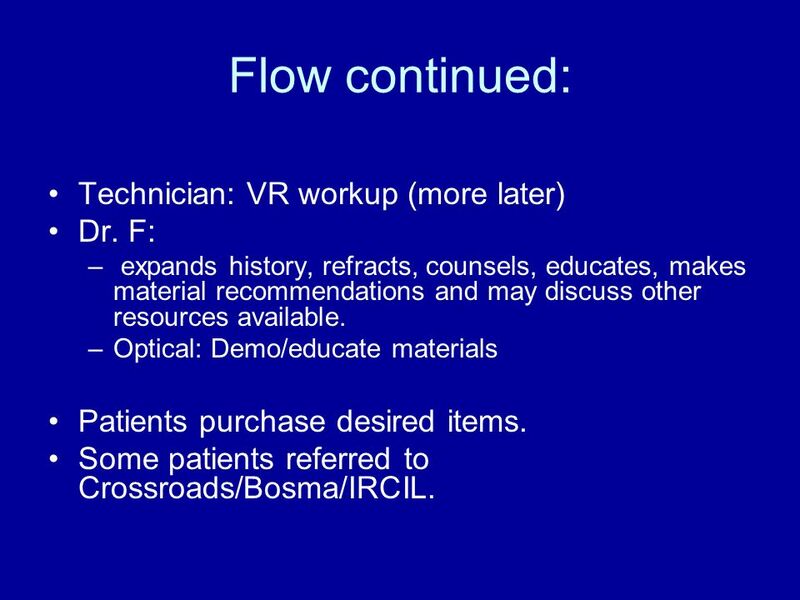 Some patients referred to Crossroads/Bosma/IRCIL. 7 Coding for Vision Rehab. Refraction fees: $ based on complexity. 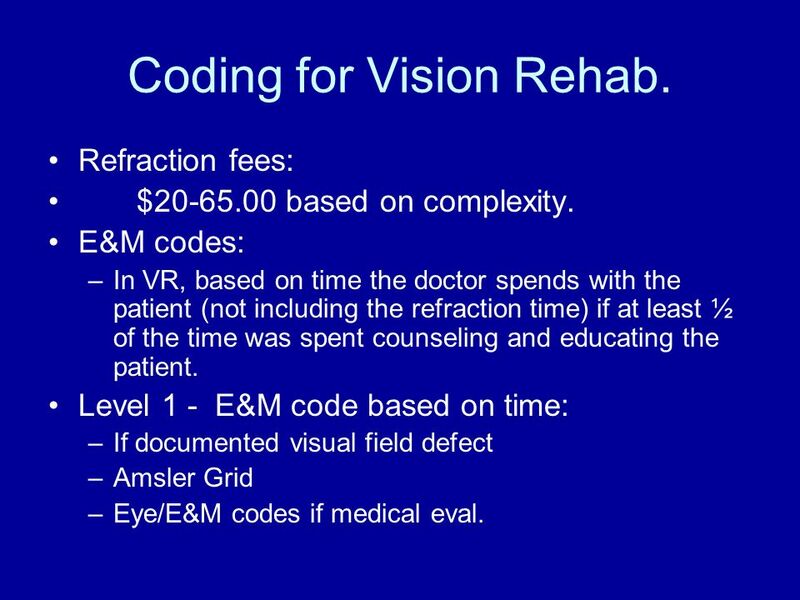 E&M codes: In VR, based on time the doctor spends with the patient (not including the refraction time) if at least ½ of the time was spent counseling and educating the patient. Level 1 - E&M code based on time: If documented visual field defect Amsler Grid Eye/E&M codes if medical eval. Because of acuity level or vf defect, can automatically use time-based E&M. Primary diagnoses: level of vision impairment Secondary diagnoses: medical (amd, etc.) 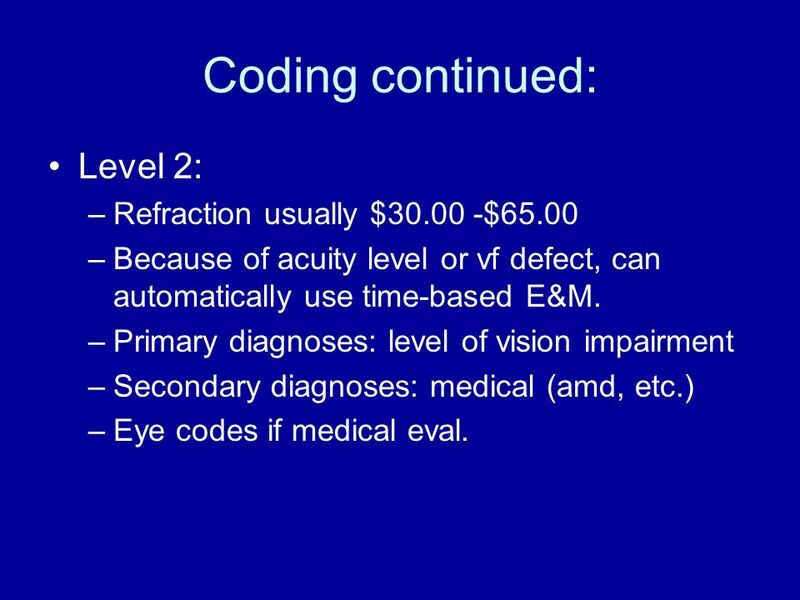 Eye codes if medical eval. 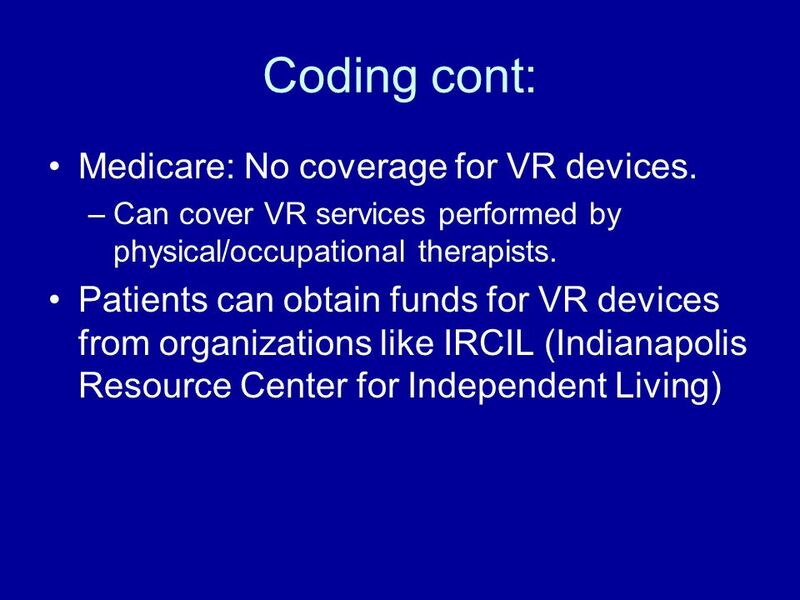 9 Coding cont: Medicare: No coverage for VR devices. 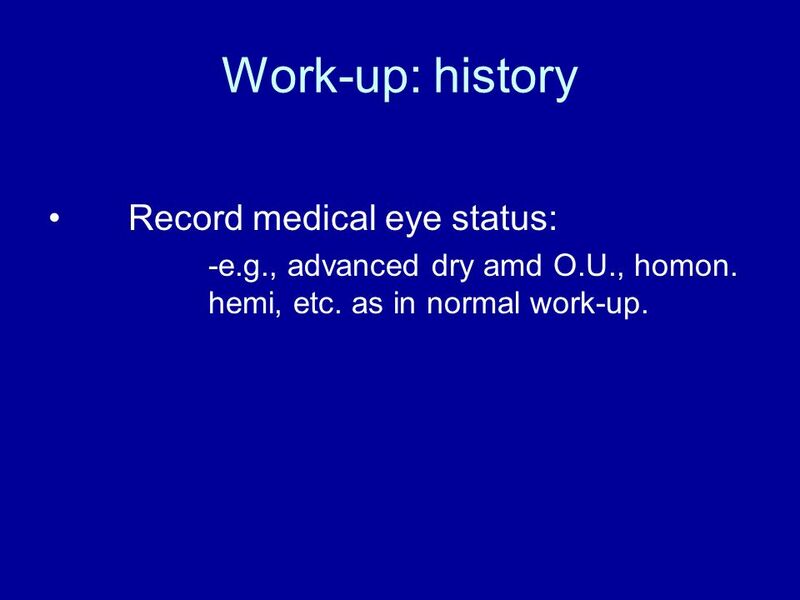 -e.g., advanced dry amd O.U., homon. hemi, etc. as in normal work-up. 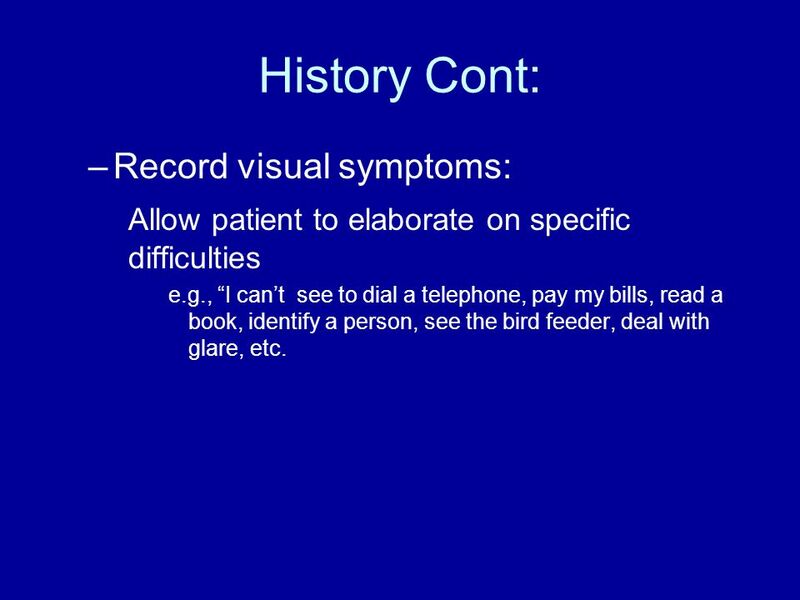 Allow patient to elaborate on specific difficulties e.g., “I can’t see to dial a telephone, pay my bills, read a book, identify a person, see the bird feeder, deal with glare, etc. 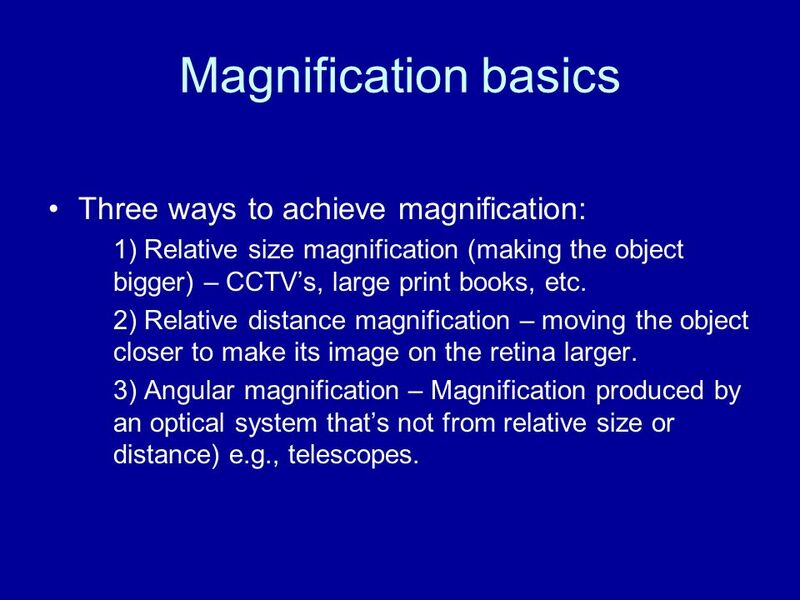 1) Relative size magnification (making the object bigger) – CCTV’s, large print books, etc. 2) Relative distance magnification – moving the object closer to make its image on the retina larger. 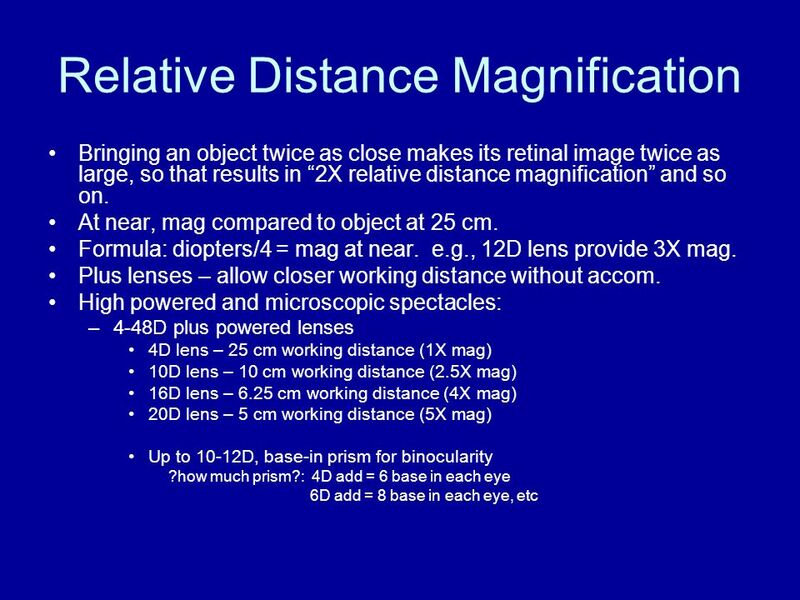 3) Angular magnification – Magnification produced by an optical system that’s not from relative size or distance) e.g., telescopes. Conceptually same as taking a microscopic spectacle lens and moving it farther away while keeping object at focal length of lens. As magnifier moves farther away, RDM decreases, angular mag increases but total remains unchanged. Same mag formula (power/4 = mag). 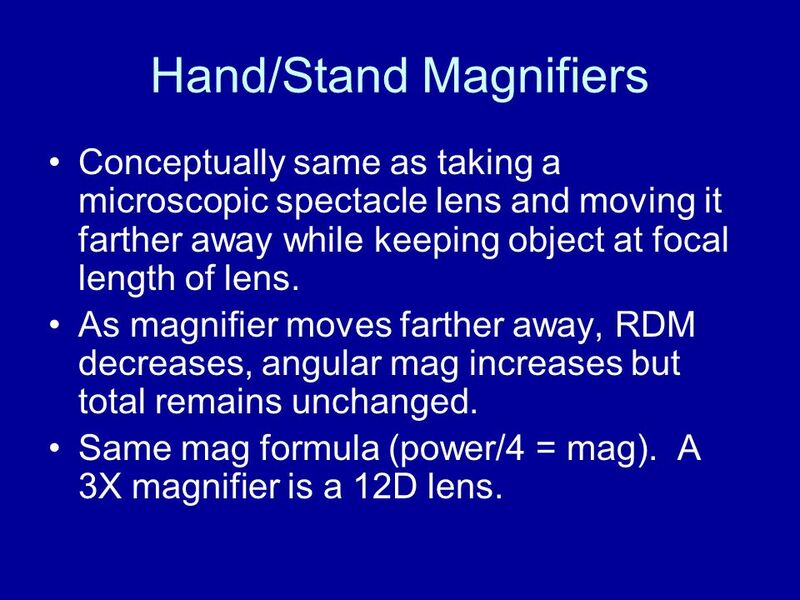 A 3X magnifier is a 12D lens. 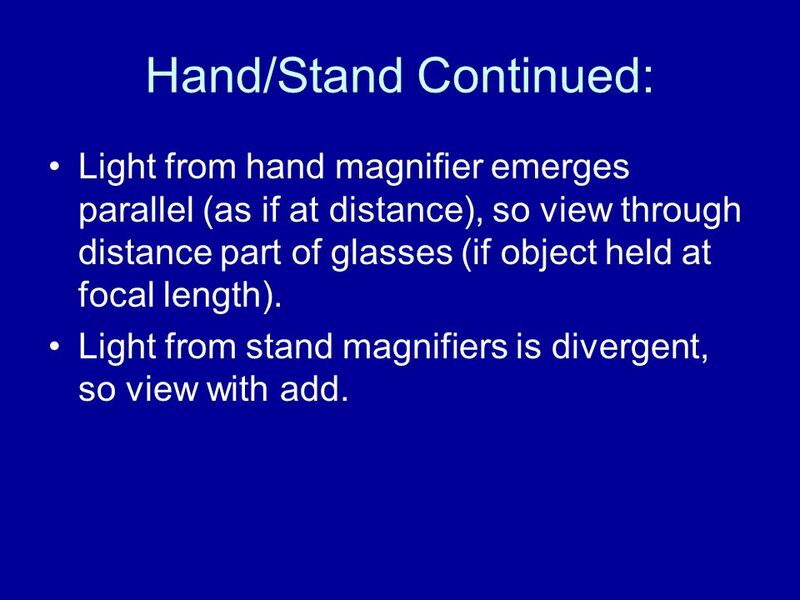 Light from hand magnifier emerges parallel (as if at distance), so view through distance part of glasses (if object held at focal length). Light from stand magnifiers is divergent, so view with add. 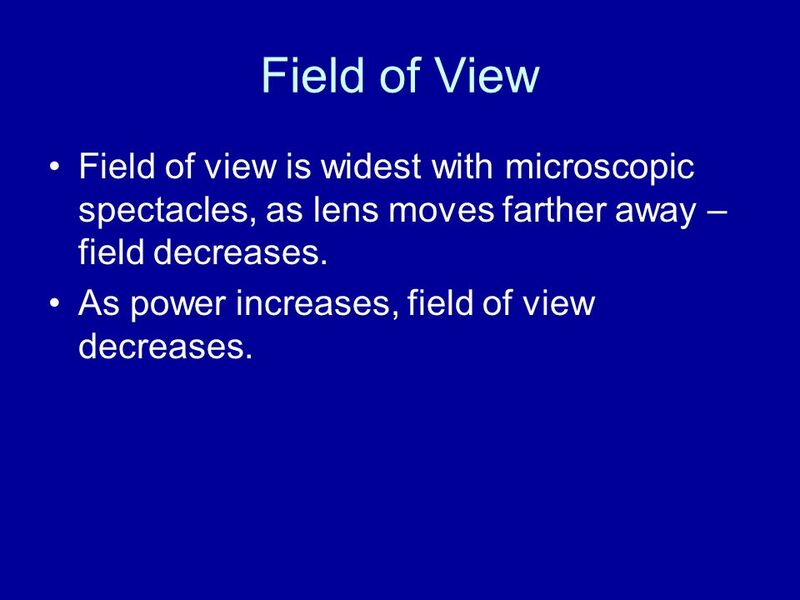 21 Field of View Field of view is widest with microscopic spectacles, as lens moves farther away – field decreases. As power increases, field of view decreases. Use a telemicroscope. A distance telescope with a “reading cap” to allow focus at a closer distance. Formula: Pt. with 20/400 vision wants to read at 25cm. 400 x 25/2000 = angular mag needed; use 4D cap for 25 cm working distance. Thus 5X telescope with 4D reading cap. 26 So what does M mean ? 1M-size letters held at 1 meter (1/1M) form an image on the retina that’s the same size as 20/20 size letters at 20 feet (5 minutes of arc). 1M print is half as big as 2M print, etc. Phone book = 1M, newspaper = 1.2M, large print = 3m. 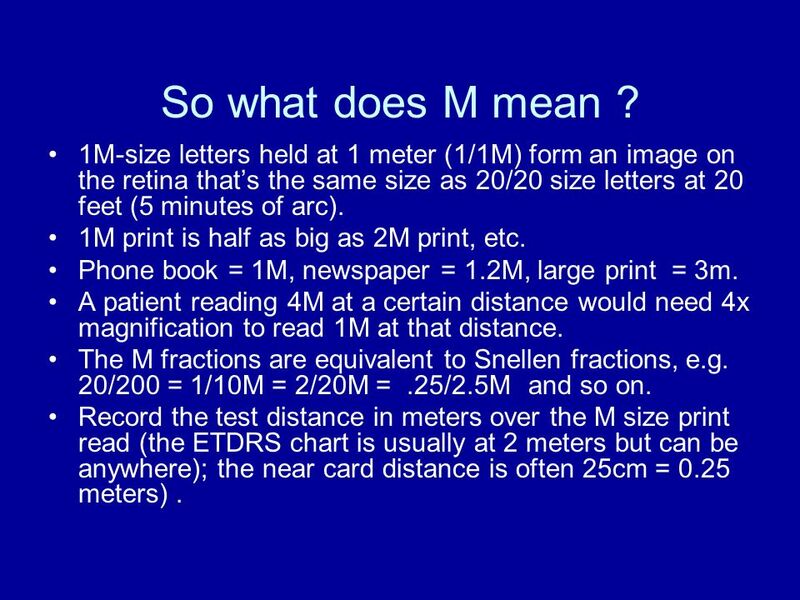 A patient reading 4M at a certain distance would need 4x magnification to read 1M at that distance. The M fractions are equivalent to Snellen fractions, e.g. 20/200 = 1/10M = 2/20M = .25/2.5M and so on. Record the test distance in meters over the M size print read (the ETDRS chart is usually at 2 meters but can be anywhere); the near card distance is often 25cm = 0.25 meters) . 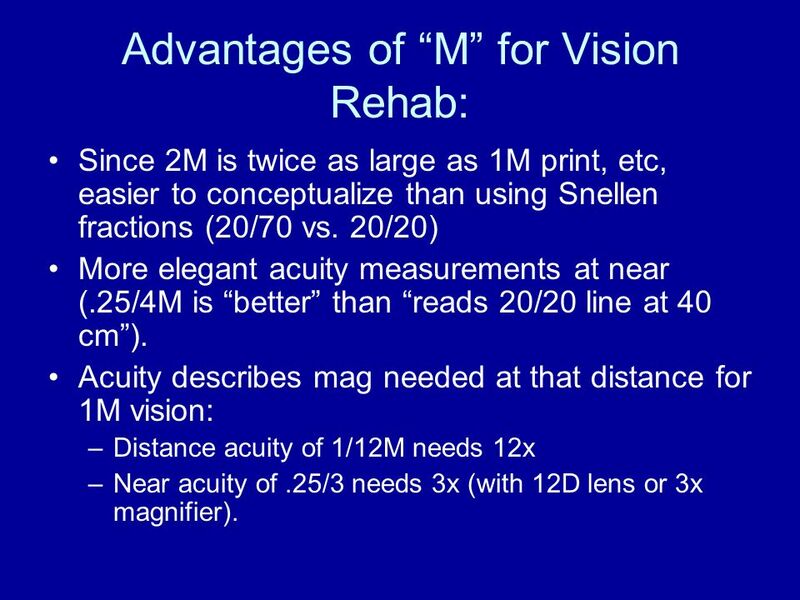 Since 2M is twice as large as 1M print, etc, easier to conceptualize than using Snellen fractions (20/70 vs. 20/20) More elegant acuity measurements at near (.25/4M is “better” than “reads 20/20 line at 40 cm”). 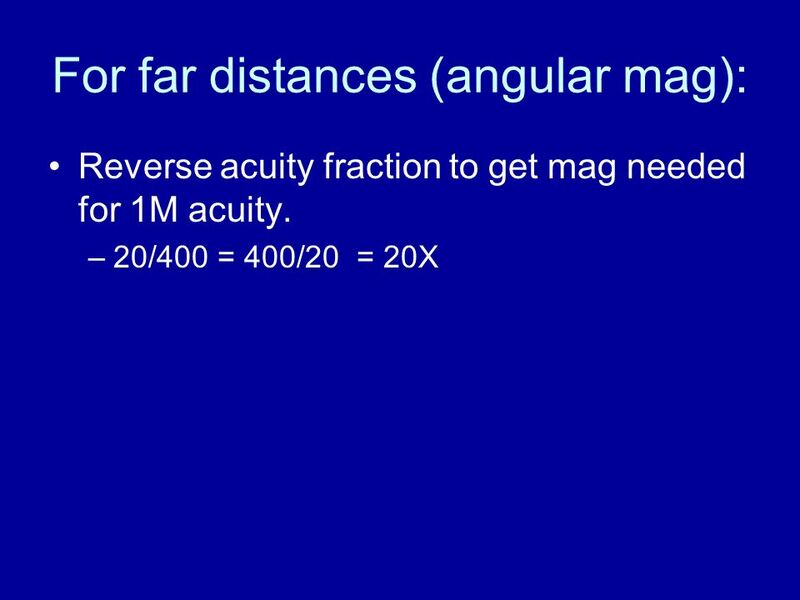 Acuity describes mag needed at that distance for 1M vision: Distance acuity of 1/12M needs 12x Near acuity of .25/3 needs 3x (with 12D lens or 3x magnifier). 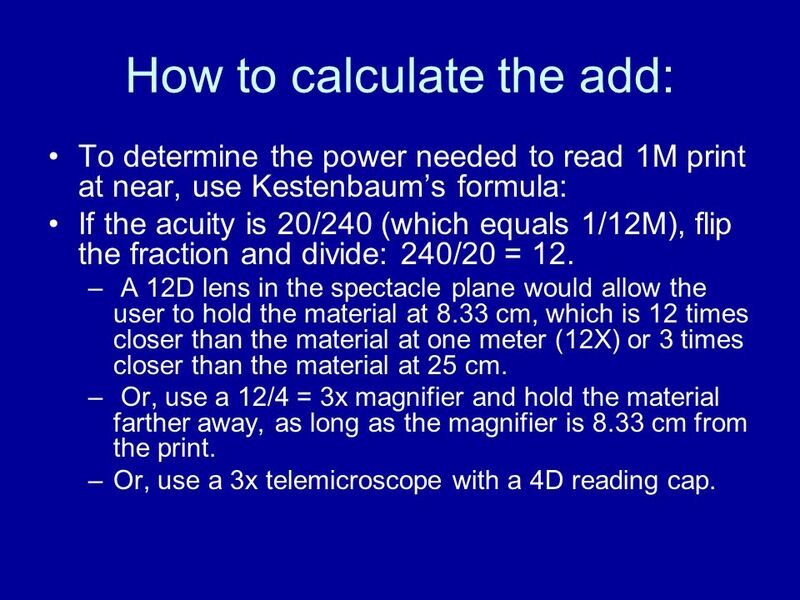 To determine the power needed to read 1M print at near, use Kestenbaum’s formula: If the acuity is 20/240 (which equals 1/12M), flip the fraction and divide: 240/20 = 12. A 12D lens in the spectacle plane would allow the user to hold the material at 8.33 cm, which is 12 times closer than the material at one meter (12X) or 3 times closer than the material at 25 cm. Or, use a 12/4 = 3x magnifier and hold the material farther away, as long as the magnifier is 8.33 cm from the print. 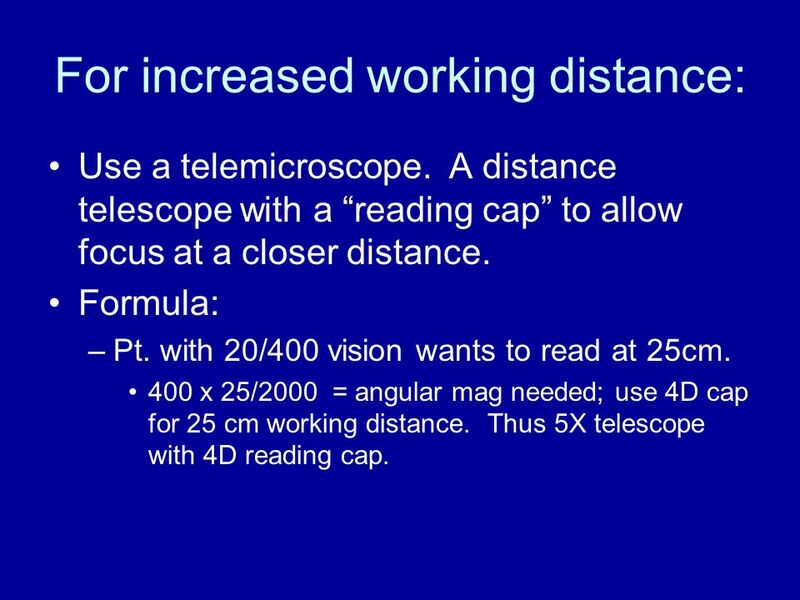 Or, use a 3x telemicroscope with a 4D reading cap. 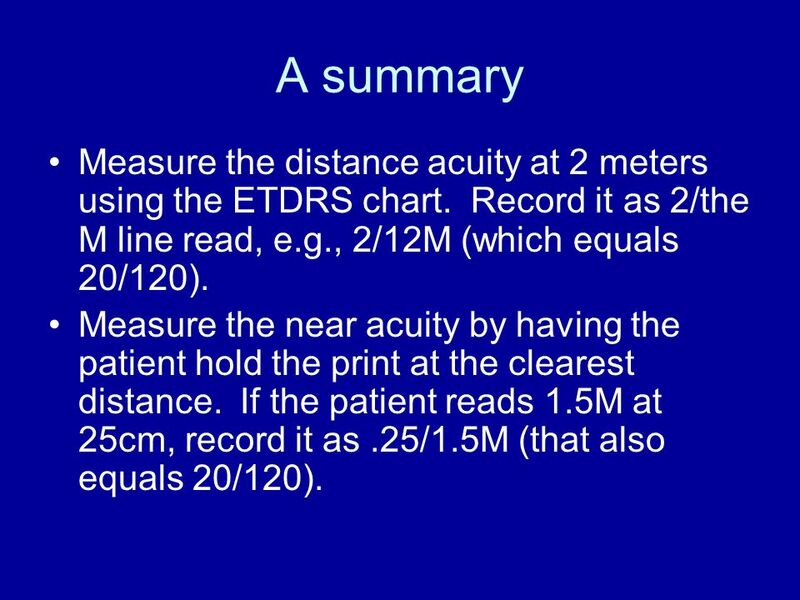 30 A summary Measure the distance acuity at 2 meters using the ETDRS chart. Record it as 2/the M line read, e.g., 2/12M (which equals 20/120). Measure the near acuity by having the patient hold the print at the clearest distance. If the patient reads 1.5M at 25cm, record it as .25/1.5M (that also equals 20/120). 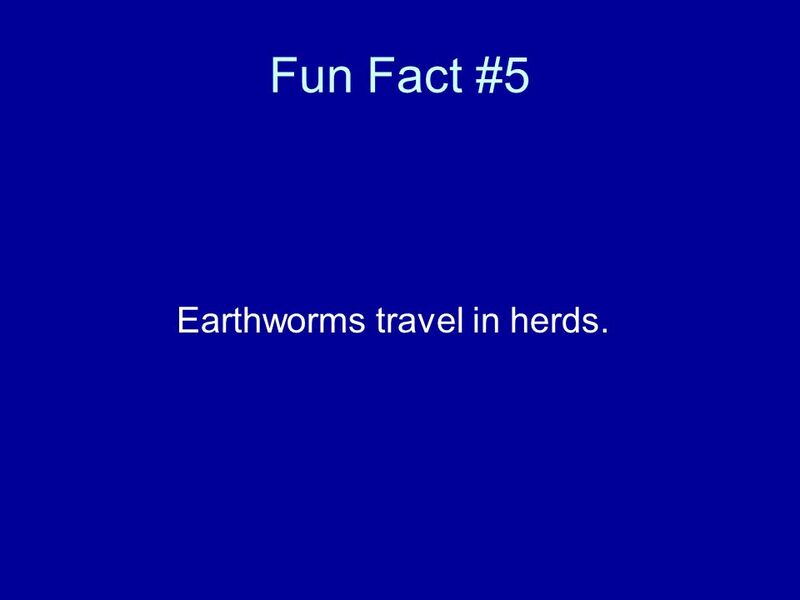 31 Fun Fact #5 Earthworms travel in herds. 32 So what materials do we provide? Stronger than usual (3-4D add) single vision reading glasses (usually level 1) Much stronger reading glasses (+4 to +48D) reading glasses (lower powers with base-in prism for binocularity) Small and large CCTV’s (the Pebble, Onyx) Hand-held, clip-on monocular and binocular telescopes. Illuminated hand-held and stand magnifiers Filter options. An assortment of near magnifier styles. High-intensity reading lamps. 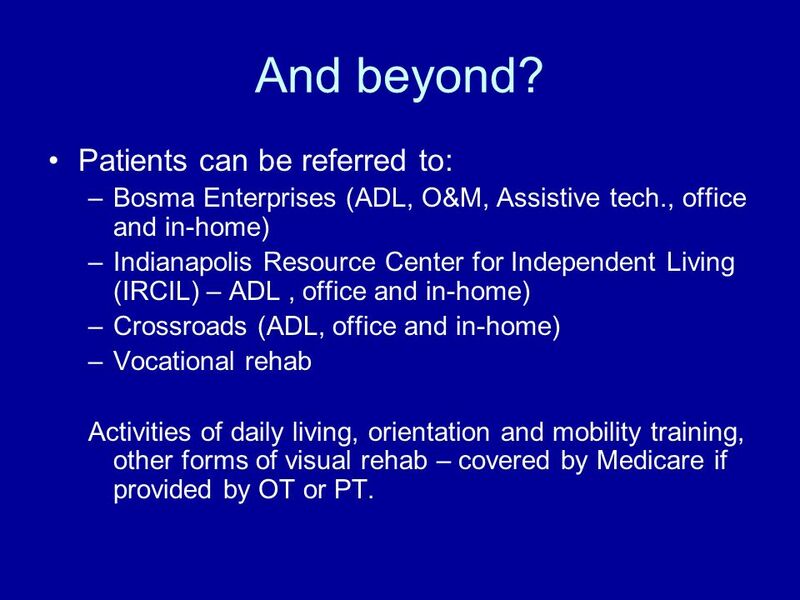 Bosma Enterprises (ADL, O&M, Assistive tech., office and in-home) Indianapolis Resource Center for Independent Living (IRCIL) – ADL , office and in-home) Crossroads (ADL, office and in-home) Vocational rehab Activities of daily living, orientation and mobility training, other forms of visual rehab – covered by Medicare if provided by OT or PT. 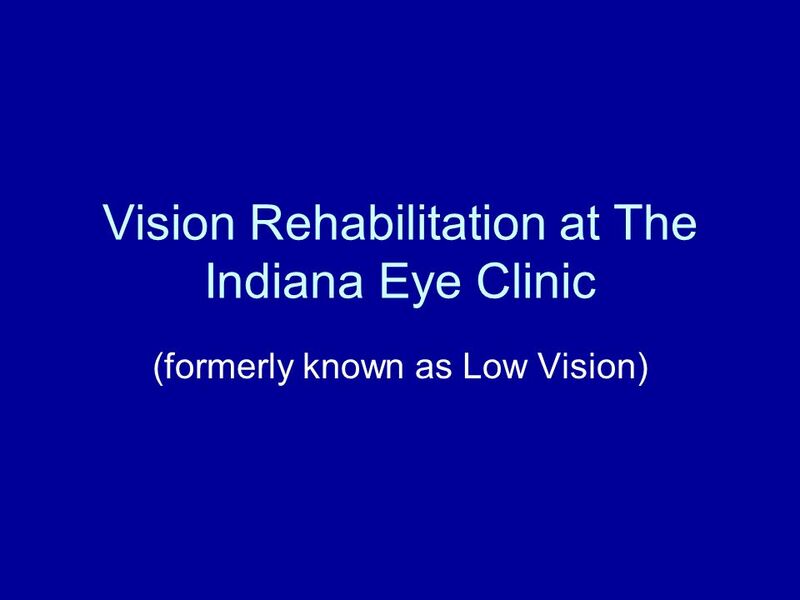 Download ppt "Vision Rehabilitation at The Indiana Eye Clinic"
A concave mirror with a focal length of 10 cm creates a real image 30 cm away on its principal axis; the corresponding object is located how far from the. Falls prevention. As you get older, so do your eyes This can affect your life in many ways. G UIDELINES FOR PRESCRIBING OPTICAL DEVICES AND TRAINING 23 February 2012. 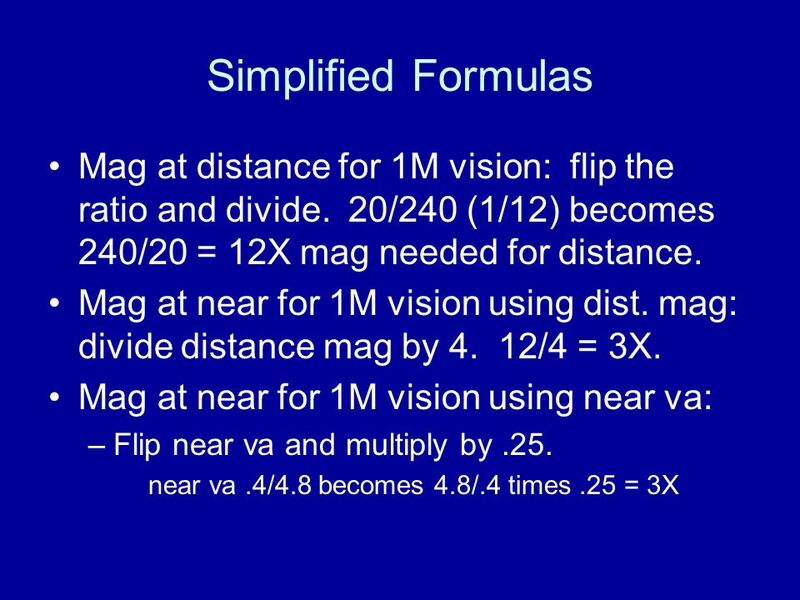 Physics 2102 Jonathan Dowling Lecture 25 Optics: Images. 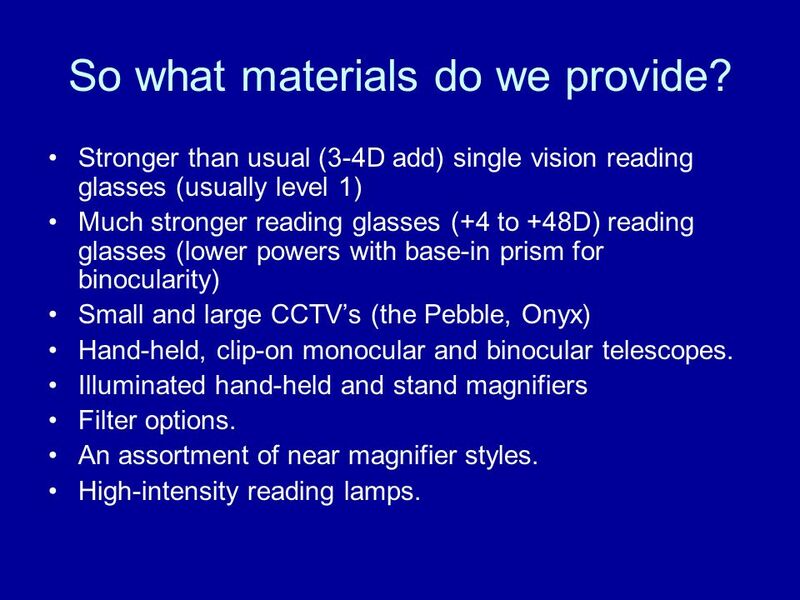 PH 103 Dr. Cecilia Vogel Lecture 8. Review Outline  Lenses  more corrective lenses  angular size and magnification  application to magnifier  Lenses. 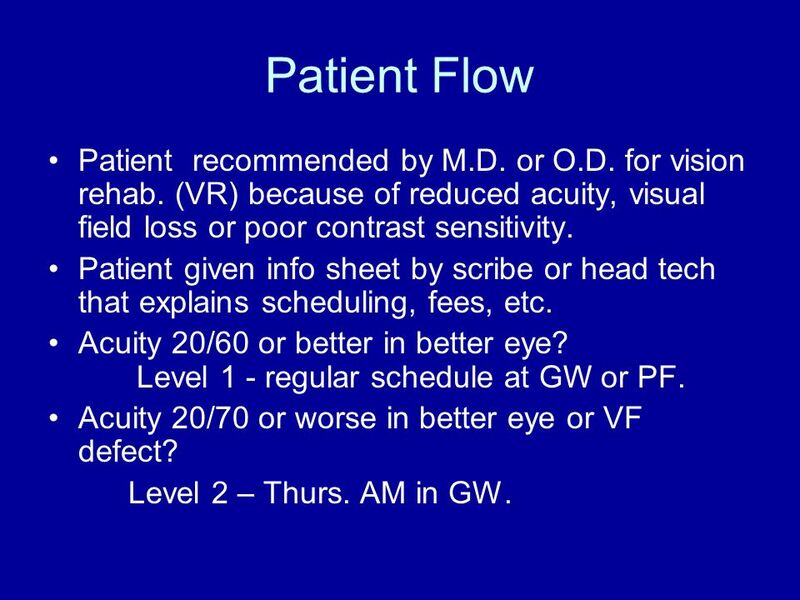 VISUAL ACUITY PRESENTED BY T.Muthuramalingam. 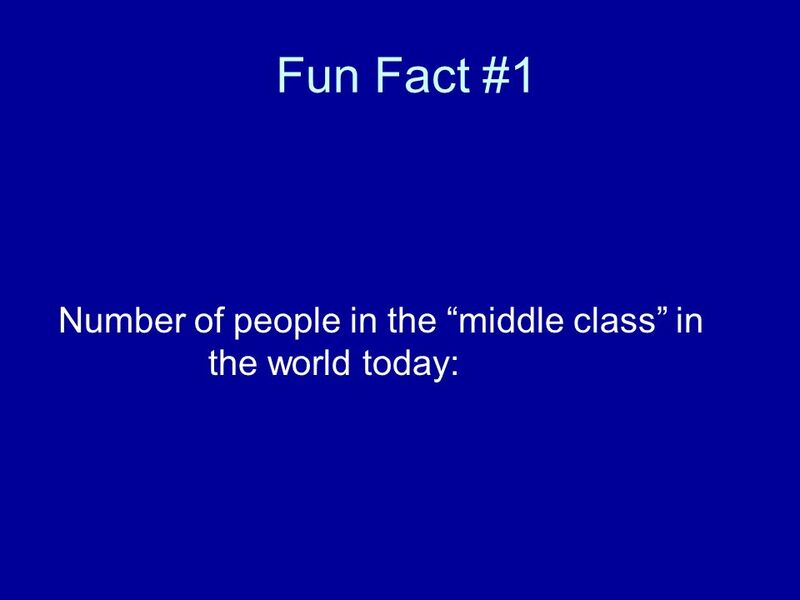  Is an ability of eye to discriminate two stimuli separated in space.  Is the resolving power of eye. Earth in Yellow Flower Presenter Name By PresenterMedia.comPresenterMedia.com By Sumitra Marda Optometrist, Ocularist, Low vision specialist, Sportvision. 1 From Last Time… Lenses and image formation Object Image Lens Object Image Thurs. Sep. 17, 2009Physics 208, Lecture 5. CHAPTERS-16 &17 Light 1.Electromagnetic waves 2.Human eye and color 3.Reflection and Image Formation 4.Refraction of Light 5.Lenses and Image Formation. 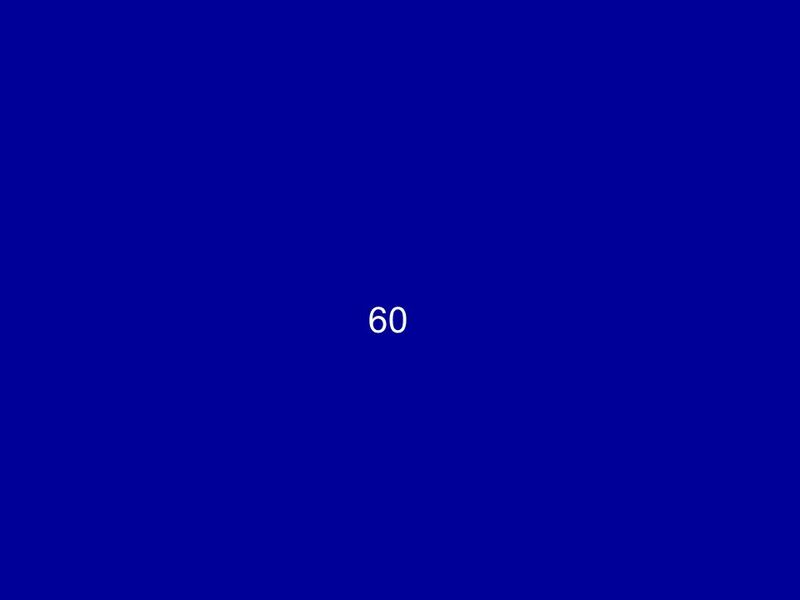 Name:____________ Fill in the Label and connect with the right function: Object takes a picture of what the eye would see Objective Lens image of object.